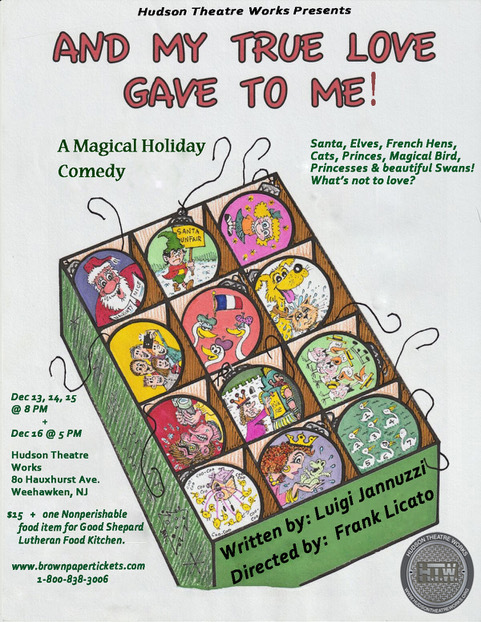 Hudson Theatre Works will present “And My True Love Gave To Me,” an original holiday comedy by Luigi Jannuzzi, at the company’s new space at 80 Hauxhurst Ave., Weehawken, on Dec. 13, 14 and 15 at 8 p.m., and Dec. 16 at 5 p.m.
Jannuzzi is a contemporary American comedic playwright and has published 27 plays. A native of New Jersey, Jannuzzi attended Bound Brook High School, Raritan Valley Community College, Salem University, WV and The University of Notre Dame, where he received a master’s degree. From 1978-2012 he taught English, drama and creative writing at Immaculata High School in Somerville. His play “A Bench At The Edge” won best one-act in Ireland in 1999 and best one-act in Scotland in 2001 and 2016 and the United Kingdom in 2001. He also wrote the screenplay for the movie. He is a recipient of two New Jersey State Council on the Arts Fellowships, two Geraldine R. Dodge Grants, three National Endowments for the Humanities (2000 at Rutgers U., 1998 at Columbia U., and 1995 at The U of Vermont), a 1986 & 2016 Goshen Peace Prize Award, a 1998 and 2000 Finalist in the Eugene O’Neill National Playwriting Conference, the 2016 Pirandello Society/NY University Playwright Award, and a 2007-2009 James Madison residency grant at Princeton University. He is listed in Contemporary Authors, Who’s Who in America and is a member of the Dramatists & Author’s Guild. Tickets are $15 plus one non-perishable food item to be donated to the Good Shepard Lutheran Food Kitchen. Tickets can be purchased at hudsontheatreworks.brownpapertickets.com, or 1-800-838-3006. The show is sponsored by Weehawken Mayor Richard Turner and the city council, UBS, The Campbell Foundation, Actors Equity, and Walmart.